The brunt of Hurricane Harvey is projected to miss Houston, but the sprawling metropolis is likely to face massive flooding from its third crippling storm in the past three years. It underscores a new reality for the nation’s fourth-largest city: Climate change is making such storms more routine. Meanwhile, unchecked development in the Houston area is wiping out the pasture land that once soaked up floodwaters. Last year, we explored in detail how Houston’s rapid expansion has greatly worsened the danger posed by flooding. 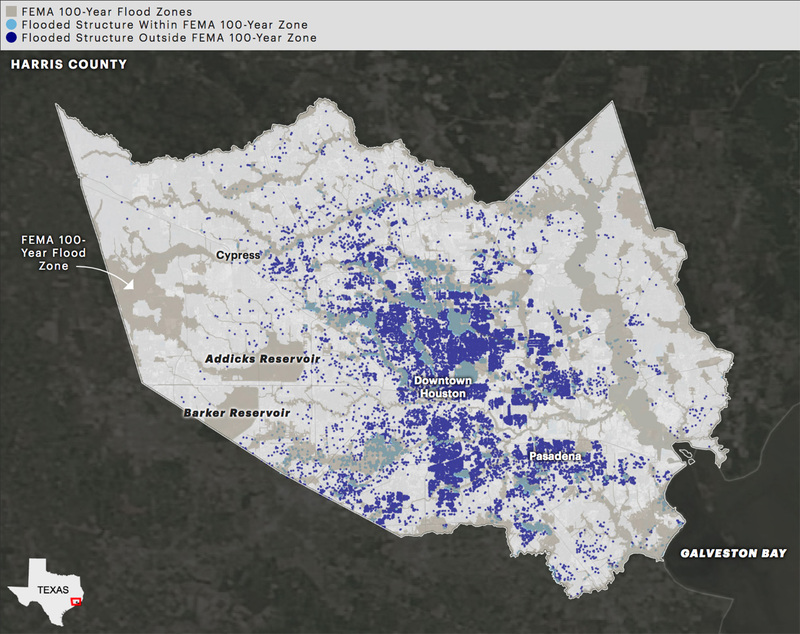 How bad things get in Houston depends on where and how quickly the rain falls. But many are already drawing comparisons to 2001’s Tropical Storm Allison — the worst rainstorm to hit an American city in modern history. Allison dropped 40 inches of rain on the city in five days, killed nearly two dozen people and caused $5 billion in damage in the county that includes Houston. The map below shows how many homes, businesses, schools and other structures flooded. 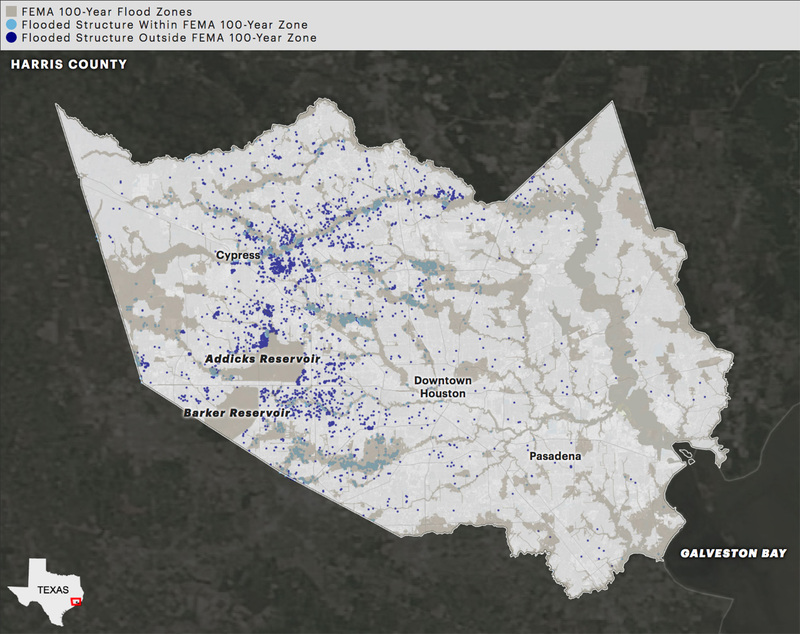 As you can see, a lot of flooded areas were outside the 100-year floodplain — the area the federal government says faces a 1 percent chance of flooding every year. 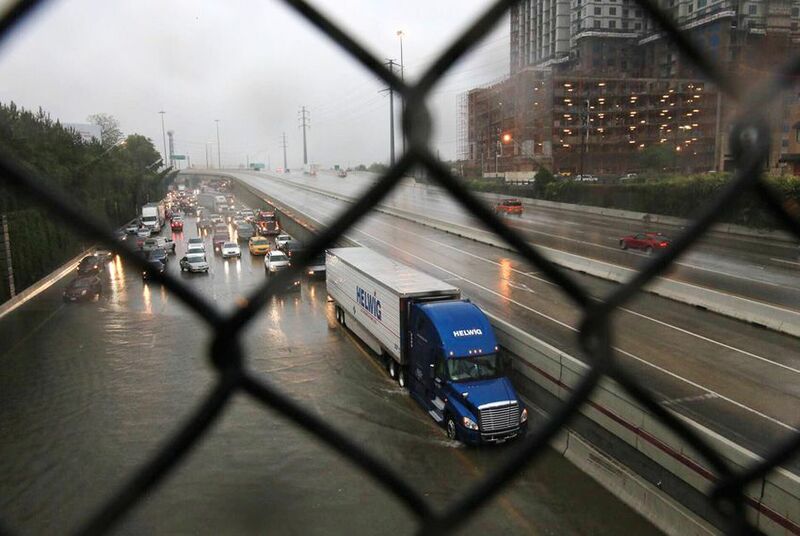 Tropical Storm Allison largely spared western parts of the Houston area. But that wasn’t the case during a more recent storm that also crippled the sprawling metropolis. A flood in April 2016 — nicknamed the “Tax Day” flood because it fell on the deadline to file federal income taxes — paralyzed northwestern portions of the city and surrounding suburbs. Those areas have exploded in population in recent years. The Tax Day flood happened just 11 months after another devastating event — the “Memorial Day” flood in May 2015, which swept through areas north and west of downtown Houston. Again, many neighborhoods outside the known floodplain ended up underwater. Together, the Memorial and Tax Day floods killed 16 people and caused well over $1 billion in property damage. Such torrential rains are supposed to be a rarity, but Houston’s history is punctuated by major back-to-back storms. Many residents say they are becoming more frequent and severe, and scientists agree. Many scientists, experts and federal officials say Houston's explosive growth is largely to blame, along with climate change. As millions have flocked to the metropolitan area in recent decades, local officials have largely rejected stricter building regulations, allowing developers to pave over acres of prairie land that once absorbed large amounts of rainwater. In the decade after Tropical Storm Allison, about 167,000 acres were developed in Harris County, home to Houston. The map below shows that a lot of the new development is in or near floodplains. Some local officials flat-out disagree with the scientific evidence that shows development has worsened the effects of big storms. Mike Talbott, the former longtime head of the local flood control agency, told The Texas Tribune and ProPublica last year that large-scale public works projects — like drainage basins — are reversing all the effects of Houston’s recent growth (His successor shares that view). The Brief: We asked for hurricane vulnerability documents. 18 months later, this is what arrived.